Stars Over Washington: Feb 28, 2015 12 am: DHS funding runs dry--during its Jupiter Return? Feb 28, 2015 12 am: DHS funding runs dry--during its Jupiter Return? The US Congress continues to rule by crisis so funds for the Department of Homeland Security will run dry by 12:01 am est February 28, 2015 unless as the clock ticks the formerly exalted body passes a 3-week band-aid or a clean bill for full funding today or this evening. Yes, Washington DC provides the country with a slapdash end of February 2015 but let's consider the month of March. As many astrologers have written, March 2015 will be replete with cosmic and earthly events of note as Washington politicians continue to live down to what they're styled into a sorry model of government---sort of a non-governing government brought to us purposefully by sold-out politicians following basically the same global government script while political factions jockey for ultimate control of the Big Picture. As for 'HoSec', as I've fondly called it, the conglomerate of agencies was hatched on November 25, 2002 at 1:44 pm est Washington DC under a fiery Sun Sag-Moon Leo influence. 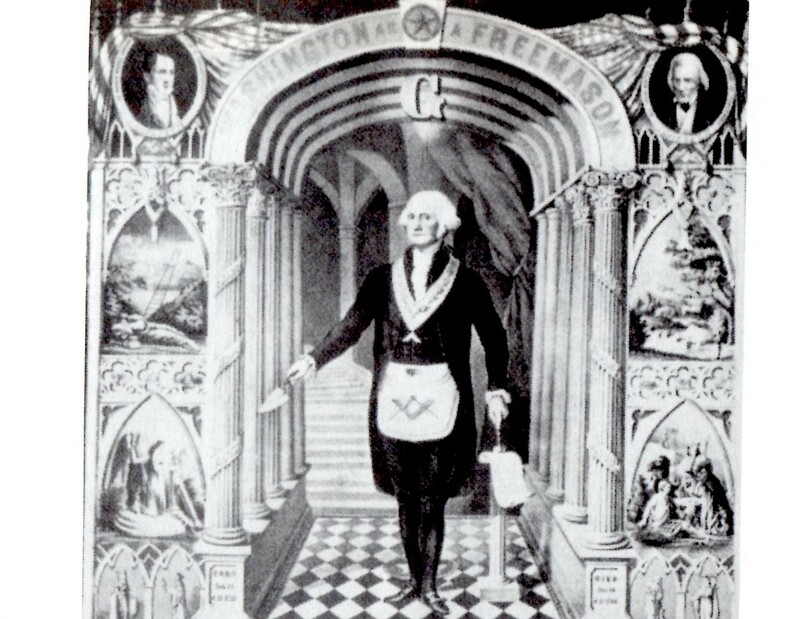 At that time, expansive Jupiter (the General; the Banker; the Guru) was in the 6th house of Military and Police Service but conjunct the 5th cusp (risk-taking, speculation, gambling) and ruled the agency itself via the Ascendant (27Pis29 with the March 20, 2015 Solar Eclipse @29Pis27 falling upon it this Spring Equinox.) 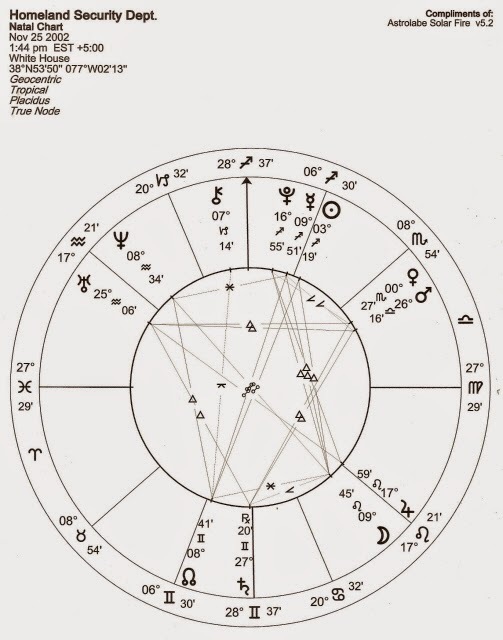 You'll find the Pisces Solar Eclipse horoscope linked, below. 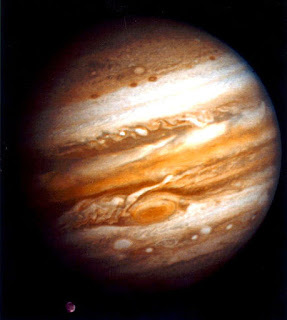 Now transit Jupiter's Rx period has (Oct 2014) and will (June 2015) return to natal degree @17Leo59. To me the fact that the DHS is in the midst of its Jupiter Return (or, Reward Cycle--Tyl) denotes that although funding delays (Rx) are to be expected, current theatrics on Capitol Hill over the DHS budget running dry are merely political antics meant to mar President Obama's White House tenure further and--if hotheads have their way--stop or stall the president's immigration plans. Does anyone need Astrology to tell them it's all a scripted power play?! Sometimes it seems that obstructionist Republicans are little boys turning blue from holding their breaths in an attempt to get a detached dad's attention! Note that the Sabian Symbol for Mercury's '10Sag' = "A Golden-Haired Goddess of Opportunity." There's much to be said for that particular word picture but since I've typed it many times before, let's not bore each other. You note the nearness to Mercury of saboteur-spy-assassin Pluto of The Underworld for the pair had recently conjoined in Sagittarius. 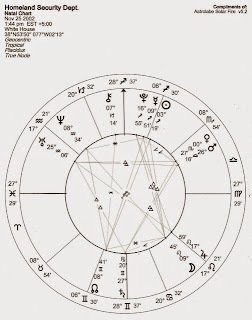 Their conjunction and nearness in this chart spotlights America's natal Mercury-Pluto opposition with its 'secrets, surveillance, propaganda, and mind control' connotations. Also note that DHS natal Venus @00Sco27 (evaluations, relationships, money) was precisely 'eclipsed' by the October 23, 2014 Solar Eclipse @00Sco24! The next March 2015 lunation is the March 5 Full Moon in Virgo, the date Purim begins. The Full Moon of March 3 is the Syzygy Moon of Spring Equinox 2015 (aka, Aries Ingress) which brings a critical 29th-degreed Solar Eclipse. 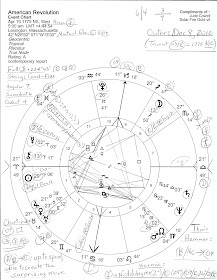 As you know, Aries Ingress charts flavor the rest of the year in which they occur until the next March--and this one has a weighty Solar Eclipse attached @29Pisces which doth 'lean forward' anxiously to reach the Mars-ruled Aries Point. Also of importance is the first lunation after Spring EQ 2015 (chart shown set for DC) which happens to be a Lunar Eclipse on April 4 @14Libra, the date that Passover begins. The April 4 lunation 'eclipses' US natal Saturn (lawmakers, laws, authority, accountability, the status quo, old men) which may indicate a cosmic link to the Netanyahu-to-Congress turmoil theatrically set up by thuggish Republicans who go out of their way to undermine congressional tradition while demonstrating once again their disdain for President Obama. The April 4, 2015 Lunar Eclipse with chart shown will be discussed more fully in a soon-to-be-published post.